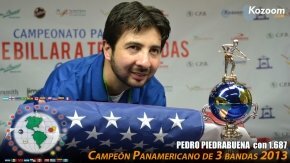 Six-time national champion Pedro Piedrabuena extended his dominance of three-cushion billiards by capturing his second Pan American Championship. Held in Cali, Colombia from June 23 to June 30, the tournament featured the best players of North, South and Central America. To get to the finals, Piedrabuena defeated defending champion Carlos Campino from Colombia in the quarter finals (40-33 in 25) and Cesar Garzon, also from Colombia, in the semi-finals (40-17 in 18). In the finals, Piedrabuena faced another Colombian, 22-year old Huberney Cataño, who jumped to a 24-7 lead. 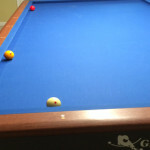 With Piedrabuena struggling, the players took the mid-game break. After the respite, Piedrabuena started scoring and Cataño began feeling the pressure of Piedrabuena’s charge. Holding a 31-28 lead, Cataño missed and left the table open for Piedrabuena, who ran a 10. After another Cataño miss, Pedro ran 2 and out to reach 40. In the equal inning, Cataño ran another 2 to make the final score 40-33. In addition to winning his second title, Piedrabuena also took home the honors for the highest grand average (1.687) and the best game (3.333). His high run in the tournament was 13, second only to Andres Naranjo’s 16. His resiliency and come-back in the final demonstrate how mentally tough Piedrabuena has become over the last two to three years. With the victory, he qualifies for the World Championship in Antwerp, Belgium, in October 2013. Also reaching the victory stand during the championship week were Americans Hugo Patiño and Mazin Shooni, who won the team championship with a 59-44 victory over Venezuela Team A (Merlin Romero and Miguel Canton). The Patiño-Shooni pairing met its stiffest competition in the quarterfinals when they squeaked out a 58-54 victory over fellow Americans Piedrabuena and Michael Kang. All four members of the United States contingent made the final 32 in the individual tournament. Shooni bowed out to Colombian Heriberto Aristizabal in the round of 32. Patiño met fellow American Michael Kang in the round of 32, with Kang coming out on top. Kang fell the next round to Huberney Cataño, leaving Piedrabuena as the remaining American in the hunt for the gold. In the final rankings, Kang finished 16th, Patiño 18th and Shooni, 29th. With the Americans taking the top prizes in the team and individual tournaments, the Pan American championship week was truly a special even for American billiards. The host country, however, showed its strength, with 16 Colombians finishing in the top 32, including taking places 2 through 10.